Swiss Re remained strongly capitalised throughout 2018 despite large industry losses, allowing us to deploy capital for potential market developments while continuing to repatriate excess capital to our shareholders. Swiss Re’s policy of ensuring superior capitalisation at all times has meant that even in the face of large insurance losses in two consecutive years, the Group maintains a very strong capital position and high financial flexibility. Swiss Re’s financial strength enables the Group to stay committed to creating sustainable long-term shareholder value by growing the regular dividend. Swiss Re’s capital management priorities aim to ensure the ability to continue operations following an extremely adverse year of losses from insurance and/or financial market events. Swiss Re’s Group Board of Directors has also defined an SST capitalisation target of 220% for the Swiss Re Group. 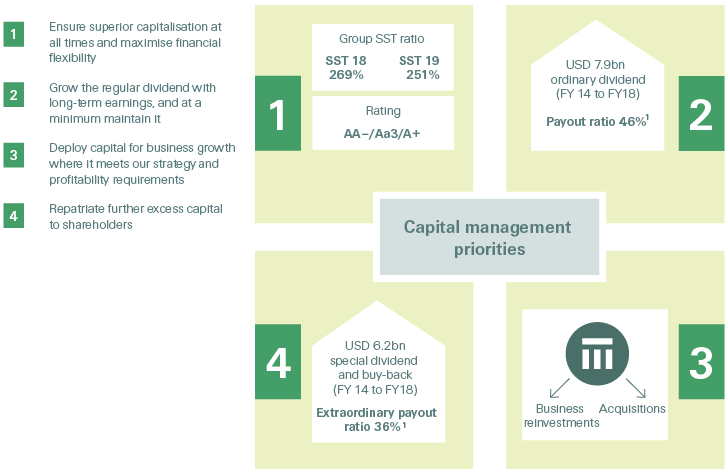 The below subsections describe Swiss Re’s capitalisation according to the SST and the financial strength ratings.